Ian Angus is the editor of Climate and Capitalism and the author of A Redder Shade of Green: Intersections of Science and Socialism, forthcoming from Monthly Review Press. One basis for life and another for science is, a priori, a lie. In the closing decades of the twentieth century, a peculiar idea took hold in parts of academia. It contended that far from being the closest of comrades and collaborators, who worked in harmony for forty years, Karl Marx and Frederick Engels in fact disagreed with each other on fundamental questions of theory and practice. Their supposed disagreements concerned nature and the natural sciences. For example, Paul Thomas contrasts “Engels’s well-known interest in the natural science” with “Marx’s lack of concern,” suggesting that “Marx and Engels are separated by a conceptual chasm that should have resisted all attempts at papering it over.”1 Terrence Ball likewise argues that “the idea (later espoused by Engels) that nature exists independently of, and prior to, man’s efforts to transform it is utterly foreign to Marx’s humanism.”2 In Ball’s view, Engels’s distortions of Marxist philosophy were directly responsible for “some of the more repressive features of Soviet practice.”3 In a still more extreme version, Terrell Carver and others insist that Marx was not a Marxist—that Marxism was a doctrine invented by Engels, whose scientific materialism was contrary to Marx’s liberal humanism. From a somewhat different perspective, Theodor Adorno, Alfred Schmidt, and others associated with the Frankfurt School and Western Marxism have argued that historical materialism applies only to human society, so Engels’s efforts to adapt it to the natural sciences in his unfinished work Dialectics of Nature were intellectual distortions that went against the Marxist method. New studies of Marx’s long-unavailable notebooks, now being published in the massive Marx-Engels-Gesamtausgabe (Marx-Engels Complete Works), decisively refute claims that Marx was uninterested in the natural sciences or considered them irrelevant to his politics. As more of this material becomes available for study, it may shed new light on the role of Carl Schorlemmer, a working scientist whose important contributions to the development of scientific socialism have been unjustly ignored. Most English-language accounts of Marx and Engels’s lives, if they mention Schorlemmer at all, refer to him only as a friend, without acknowledging his influence on their studies of the natural sciences.6 It is time to restore this neglected figure to his rightful place in the Marxian—and Engelsian—tradition. 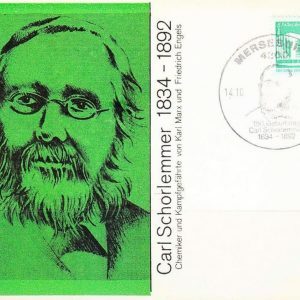 Carl Schorlemmer was born in 1834 in Darmstadt, in the Rhine-Main region of what is now Germany. The son of a carpenter, he studied pharmacy at the Darmstadt technical college, and chemistry at the University of Giessen. In 1859, he was hired as an assistant to chemistry professor Henry Roscoe at Owens College in Manchester, where he lived for the rest of his life. Schorlemmer was one of the most respected and gifted chemists of his time. In his first decade in Manchester he published more than two dozen scientific papers, many of them groundbreaking studies of hydrocarbon chemistry. He was elected a Fellow of the Royal Society in 1871, and appointed to England’s first chair in organic chemistry, at Owens College, in 1874. He served as vice-president of the chemical section of the British Academy in the 1880s, and when he received an honorary doctorate from the University of Glasgow in 1888, the presenter described him as “one of the greatest living writers and authorities on organic chemistry.”7 After his death, Owens College spent £4800—equivalent to more than $1 million today—to build and equip the Schorlemmer Memorial Laboratory, the first facility in England devoted solely to organic chemistry. And he was a communist. Schorlemmer quickly became Engels’s closest friend in Manchester, and was welcomed into Marx’s extended family circle in London. His sense of humor prompted Marx to dub him Jollymeier, a nickname that stuck for the rest of his life. He was a frequent visitor in the Marx and Engels family homes, and spent most of his summer vacations with them in London or at the seaside. He accompanied Engels on visits to the United States and Canada in 1888 and Norway in 1890. Marx, Engels, and Schorlemmer were thus more than friends—they shared a political commitment and social vision. Engels later recalled that when they met, the chemist was already “a complete Communist,” and had been for some years: “all he had to learn from us were the economic grounds for a conviction he had gained long ago.”11 As part of this teaching process, Engels shared with him the proofs of the first volume of Capital, before Marx’s masterpiece was published. Schorlemmer joined the International Workingmen’s Association (the First International), and the German Social Democratic Party. When the police appeared to be opening Marx and Engels’s letters, he allowed his home address to be used for their correspondence and parcels, and during trips to scientific conferences on the continent, he helped strengthen links with socialists there. On one such visit in 1883, the police detained him and searched his family’s home, because his presence at Marx’s funeral had been mentioned in the socialist press. He was suspected of (and probably was, in fact) smuggling banned socialist literature into Germany. But Schorlemmer’s most lasting contribution was in helping Marx and Engels to understand the latest developments in the natural sciences. “A chemist has recently explained Tyndall’s experiment with light to me,” was Engels’s first mention of his new friend to Marx.12 Many more explanations of the latest developments in science would follow. No one could reasonably describe the author of that letter as exhibiting “lack of concern” about science! We can see that side of him in May 1873, when Engels wrote to Marx, who was visiting Manchester, asking for comment on some “dialectical points about the natural sciences” that had occurred to him. The object of science: matter in motion, bodies. Bodies cannot be separated from motion, their forms and kinds can only be apprehended in motion; nothing can be said about bodies divorced from motion, divorced from all relation to other bodies. Only in motion does the body reveal what it is. Hence natural science obtains knowledge about bodies by examining them in their relationship to each other, in motion. Cognition of the various forms of motion is cognition of bodies. The investigation of these various forms of motion is therefore the chief object of the natural sciences. The simplest form of motion is change of place (within time, to do old Hegel a favour)—mechanical motion. into the laws of trajectories and lead directly to the interaction of several bodies—planetary, etc., motion, astronomy, equilibrium—temporarily or apparently to motion itself. The real result of this kind of motion, however, is ultimately always the contact of the moving bodies; they fall into one another. Mechanics of contact—bodies in contact. Ordinary mechanics, levers, inclined planes, etc. But this does not exhaust the effects of contact. Contact is manifested directly in two forms: friction and impact. It is a characteristic of both that, at certain degrees of intensity and under certain conditions, they give rise to new effects, no longer of a merely mechanical nature: heat, light, electricity, magnetism. Physics proper, the science of these forms of motion, establishes the fact, after investigating each form of motion separately, that they merge into one another under certain conditions, and ultimately discovers that given a certain degree of intensity, which varies for different moving bodies, they all produce effects that transcend physics; changes in the internal structure of bodies—chemical effects. Chemistry. In the case of the preceding forms of motion it was more or less immaterial whether the bodies under investigation were animate or inanimate. In fact inanimate objects revealed the nature of the phenomena involved in their greatest purity. Chemistry, on the other hand, can only discover the chemical nature of the most important bodies by using substances deriving from the life process. Its principal task is increasingly that of producing these substances synthetically. It forms the transition to the science of organisms, but the dialectical point of transition can only be constructed when chemistry has effected the real transition or is on the point of doing so. Engels concluded that “since you are at the very centre of the natural sciences”—a jocular reference to the fact that Marx was temporarily staying in the boarding house where Schorlemmer lived—he would be in the best position to judge whether these thoughts made sense. These were indeed dialectical points. All matter is in constant motion. Under certain conditions, change in place or time becomes qualitative change—mechanical energy transforms into heat, light, electricity, or magnetism. Physical changes in turn produce chemical changes, and chemical changes give rise to living organisms. At each “dialectical point of transition,” something entirely new emerges. The three socialists discussed these and related topics at length during their frequent visits to each other’s homes. Engels’s “dialectical points,” in more developed and detailed form, are key themes of his two major projects of the 1870s: the incomplete drafts and notes published long after his death as Dialectics of Nature, and the very influential Herr Eugen Dühring’s Revolution in Science (better known as Anti-Dühring), written and published in 1876–78, which deals extensively with dialectics and natural science. Although Schorlemmer’s contributions to those works were not acknowledged in the text—possibly out of concern that mention in a communist book might harm his career or endanger his family in Germany—they were undoubtedly substantial. Engels later wrote that he had read Anti-Dühring aloud to Marx before it was published, and that Marx agreed with it. Critics who cite Anti-Dühring as an example of Marx and Engels’s disagreements have accused Engels of lying about that. Paul Thomas, for example, calls it “a curious claim, since Marx was not incapacitated or bedridden at the time it was written, and listening to a recitation of its ponderous contents would have taxed the patience of Job.”24 Bear in mind, however, that Anti-Dühring was written and published in installments over the course of two years, and given what we know of their working relationship, it is likely that Engels and Marx—and Schorlemmer, when he was in London—read and discussed the handwritten drafts together. The easiest way to do that would have been for Engels to begin by reading aloud. Note also that Marx himself contributed a chapter on economics in Anti-Dühring, and that in 1880 he wrote the introduction to three chapters of the book that were published separately as Socialism: Utopian and Scientific. He would scarcely have done either for a book he had not read, much less one with which he fundamentally disagreed. After Schorlemmer’s death in 1892, Engels remarked that it would be difficult to find a biographer who could do justice to his life. It would require someone “who is not only a chemist but also a Social Democrat, and not only a Social Democrat but also a chemist and, what’s more, a chemist who has made a close study of the history of his discipline since Liebig’s day.”29 That, of course, was a description of Schorlemmer himself, a man whose unique talents allowed him to work with Marx and Engels in developing a body of thought that integrated insights from the social and natural sciences. In a famous lecture at Cambridge University in 1959, the British novelist and scientist C. P. Snow decried the division of the academic world into “two cultures,” with the natural sciences on one side and the humanities on the other, separated by a “gulf of mutual incomprehension.”30 While he questioned both sides, he was particularly outraged by the attitude of arrogant dismissal that many specialists in the humanities displayed toward science and scientists. When Marx and Engels wrote those words, they were developing the philosophical basis for scientific socialism. A defining principle of that philosophy was that thought isolated from practice is meaningless: “Man must prove the truth, i.e. the reality and power, the this-worldliness of his thinking in practice.”33 What they were really setting out might therefore be best viewed as a set of hypotheses that required testing in the real world. For the rest of their lives, Marx and Engels tested their ideas about how the world works and changes, through active participation in workers’ movements and through intense study of history, economics, and, crucially, the natural sciences. They did this not only to satisfy their intellectual curiosity, though both men had that in abundance, but because they knew it was impossible to understand and combat capitalism without a thorough and rigorous understanding of the material context within it had developed and could change in future. For them, and for Carl Schorlemmer, the scientific study of nature was inseparable from the struggle for a better world. ↩Paul Thomas, Marxism and Scientific Socialism: From Engels to Althusser (New York: Routledge, 2008), 11, 45. ↩Terence Ball, “Marx and Darwin: A Reconsideration,” Political Theory 7, no. 4 (1979): 478. ↩Terrence Ball, “Marxian Science and Positivist Politics,” in Terence Ball and James Farr, eds., After Marx (Cambridge, UK: Cambridge University Press, 1984), 235. ↩Kohei Saito, “Why Ecosocialism Needs Marx,” Monthly Review 68, no. 6 (November 2016): 60. ↩Kohei Saito, “Marx’s Ecological Notebooks,” Monthly Review 67, no. 9 (February 2016): 25–26. ↩An important exception to the general neglect of Schorlemmer’s contributions to Marxism is John L. Stanley and Ernest Zimmerman, “On the Alleged Differences Between Marx and Engels,” in John L. Stanley, Mainlining Marx (New Brunswick NJ: Transaction, 2002), 31–61. W. O. Henderson’s The Life of Friedrich Engels (London: Cass, 1976) includes a good biographical sketch, but is silent on Schorlemmer’s contributions to Marxist theory. ↩Henderson, Life of Friedrich Engels , vol. 1, 262–71. 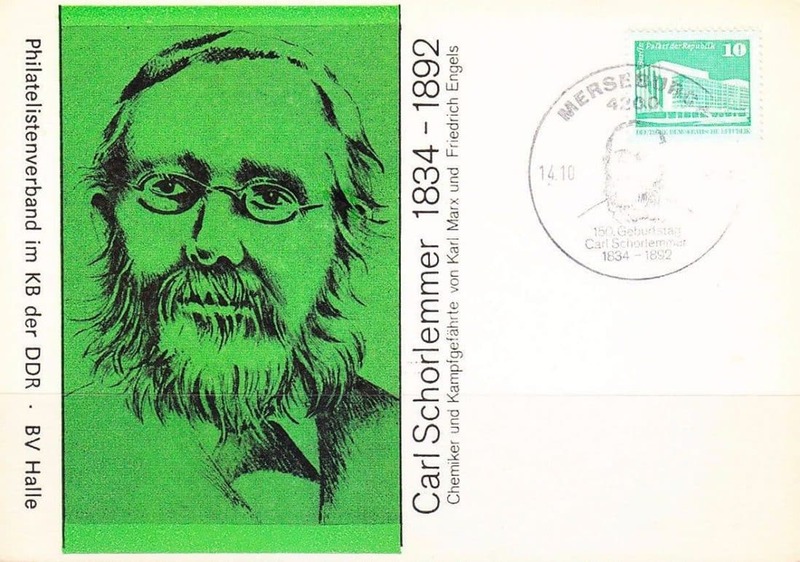 ↩In his 1892 obituary tribute to Schorlemmer, Engels said they met at the beginning of the 1860s, but his earliest mention of the chemist is in a letter to Marx dated March 6, 1865. Karl Marx and Frederick Engels, Collected Works [ MECW ], vol. 42 (London: Lawrence and Wishart, 1987),117. Engels to Marx, May 10, 1868, MECW , vol. 43 (London: Lawrence and Wishart, 1988), 33. ↩Frederick Engels, “Karl Marx’s Funeral,” MECW , vol. 24 (London: Lawrence and Wishart, 1989), 471. This translation is from Philip Foner, ed., Karl Marx Remembered (San Francisco: Synthesis, 1983), 43. ↩Engels to Eduard Bernstein, February 27, 1883, MECW , vol. 46 (London: Lawrence and Wishart, 1992), 446. ↩ MECW , vol. 27 (London: Lawrence and Wishart, 1990), 305. ↩Engels to Marx, March 6, 1865, MECW , vol. 42, 117. ↩ MECW , vol. 27, 305. ↩Theodore Benfey and Tony Travis, “Carl Schorlemmer: The Red Chemist,” Chemistry and Industry , June 15, 1992, 441–44. ↩Marx to Engels, February 13, 1866. MECW , vol. 42, 227. ↩John Bellamy Foster, Marx’s Ecology (New York: Monthly Review Press), 2000. ↩Marx to Engels, December 7, 1867, MECW , vol. 42, 495; Marx to Engels, January 3, 1868, MECW , vol. 42, 507–08. ↩Marx to Engels, February 4, 1868, MECW , vol. 42, 536. ↩The letter to Schorlemmer has not survived, but Marx mentioned his intention in Marx to Engels, February 11, 1870, MECW , 43 (London: Lawrence and Wishart, 1988), 426. At that time guncotton was too unstable for practical use. A safe version, called cordite, was patented in 1889. ↩Engels, “Carl Schorlemmer,” MECW , vol. 27, 305. ↩Engels to Marx, May 30, 1873, MECW , vol. 44 (London: Lawrence and Wishart, 1989), 500–01. Emphasis in original. ↩Marx to Engels, May 31, 1873, MECW , vol. 44, 500, 503. ↩ MECW , vol. 44, 500–01, includes Schorlemmer’s marginal comments as footnotes. ↩Thomas, Marxism and Scientific Socialism , 46. ↩Stanley, Mainlining Marx , 51. ↩ MECW , vol. 47 (London: Lawrence and Wishart, 1997), 602n. ↩Engels to Paul Lafargue, May 19, 1885, MECW , vol. 47, 289. ↩Carl Schorlemmer, The Rise and Development of Organic Chemistry , revised ed. (London: Macmillan, 1894), 142. This edition was edited by Schorlemmer but not published until after his death. The translation of the line from Anti-Dühring in MECW (vol. 25, 118) is slightly different. ↩Engels to Ludwig Schorlemmer, December 1, 1892, MECW , vol. 50 (London: Lawrence and Wishart, 2004), 45. ↩C. P. Snow, The Two Cultures and the Scientific Revolution (New York: Cambridge University Press, 1961), 4. ↩Liz Else, “Slavoj Žižek: Wake Up and Smell the Apocalypse,” New Scientist , August 25, 2010. Jason W. Moore, “Name the System! Anthropocenes & the Capitalocene Alternative,” Jason W. Moore blog, October 9, 2016, http://jasonwmoore.wordpress.com. ↩Karl Marx and Frederick Engels, “The German Ideology” (1847), MECW , vol. 5 (London: Lawrence and Wishart, 1976), 28n. ↩Karl Marx, “Theses on Feuerbach,” MECW , vol. 5, 3.